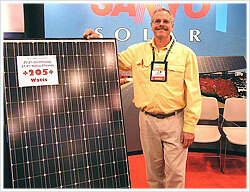 Solar Mike designs high quality solar power systems. Working with a team of experienced solar professionals, they have built hundreds of solar electric systems in California. Mike specializes in residential systems, on all types of roofs, and custom installations. His work spans the range of home size and need, from cottages to mansions. "How can I get a solar electric system?" Generate your own electricity and lower or eliminate your electric bill. Solar panels mounted on the roof or ground convert sunlight directly into electricity, and send the power into your building. If you generate more power than you use, the extra electricity runs your electric meter backwards and credits your account. Most homes have enough sunlight to generate all their electricity from solar energy.